Great Western is a rural and tourist village on the Western Highway about midway between Ararat and Stawell. 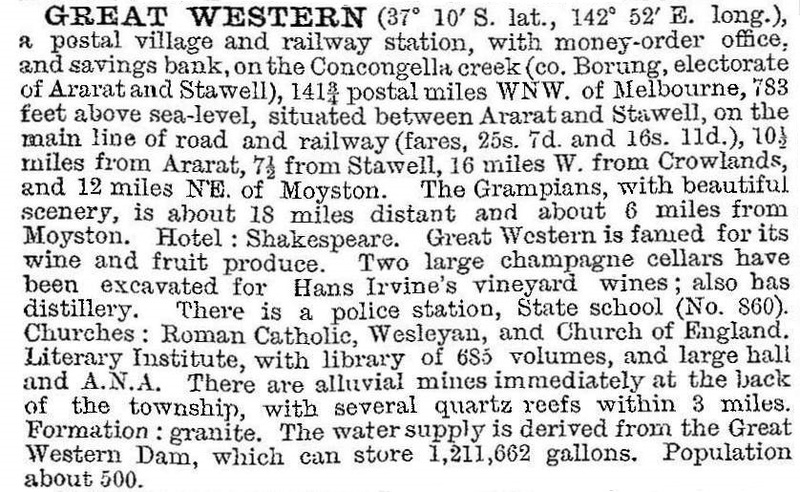 Situated between these two gold towns, Great Western was itself first a gold field opened in January 1858. The place name probably expressed the miners’ optimism. The Concongella Creek runs through Great Western, and its undulating topography is surrounded by low ranges. In the early 1860s various winegrowers planted vineyards there, the most productive being Henry and Joseph Best. In 1870 Joseph Best employed out of work miners to hew out underground cellars for wine storage. Henry Best established the Concongella vineyard, which continues to carry his name, although it passed to another firm. The vineyard established by Joseph Best has become the Greater Western (Seppelts) vineyard. It was enlarged by an entrepreneurial Hans Irvine who introduced champagne and other bottle fermented wines. Irvine’s vineyard was acquired by Seppelts in 1918, and has produced an extensive range of still and sparkling wines, drawing on grapes grown by themselves and local producers. These viticultural activities have been a continuing source of local employment. Seppelts champagne cellars are heritage listed. Great Western is conveniently located among the tourist attractions of the Grampians National Park and Halls Gap to the west, Stawell and Ararat. It is the centre of the Great Western wine region, which extends southwards to the Ararat area. The wine industry and tourism have helped stem a loss of population. There are also a general store, a hotel/motel, a public hall, an Anglican church, craft shops, a recreation reserve and a reticulated water supply from a local reservoir. The annual race meeting is held on Australia Day. In 2005 new owners Southcorp relocated most of its sparkling wine production and packaging and distribution from Great Western to its Karadoc winery near Mildura while keeping open its cellar door at the Seppelts Great Western Winery. In 2007 the Australian Geographical Indication 'Great Western' was entered in the Register of Protected Names in response to a direction from Wine Australia. It was a designated area within the Grampians region. It was protected by Best's Wines and Southcorp. In September 2010 and again in January 2011 many parts of regional Victoria experienced widespread severe flooding. Flash floods in Great Western forced a number of residents to flee their homes as the Concongella Creek rose dramatically. The Great Western primary school enrolments have been 61 in 1998, 28 in 2010 and 21 in 2014.